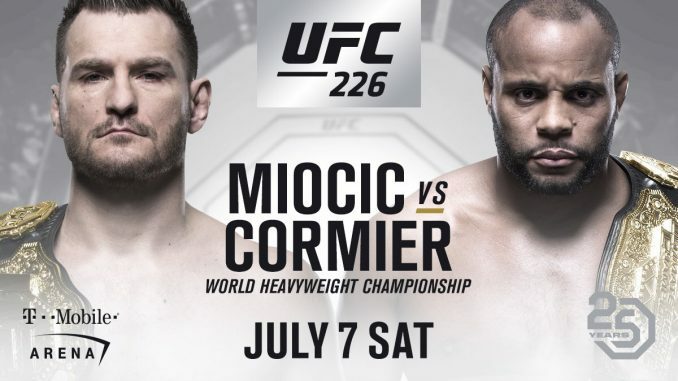 The UFC announced on Friday that a Champion vs. Champion bout has been signed with heavyweight champion Stipe Miocic set to defend his championship against reigning light heavyweight champion Daniel Cormier this July. The UFC announced on Friday that a Champion vs. Champion bout has been signed with heavyweight champion Stipe Miocic set to defend his title against reigning light heavyweight champion Daniel Cormier this July. The heavyweight championship fight will headline UFC 226 on Saturday, July 7th in Las Vegas at the T-Mobile Arena during International Fight Week. The two champions will also serve as coaches for the upcoming season of “The Ultimate Fighter”, which begins shooting imminently. The fight was discussed by UFC president Dana White last weekend following both men’s victories at UFC 220 in Boston. However, Cormier’s initial reaction was lukewarm to the idea of returning to heavyweight and stepping ahead of teammate Cain Velasquez. Miocic just defended the heavyweight title for a record-setting third time with a decision victory Francis Ngannou and is unbeaten dating back to December 2014, where he dropped a decision to former champion Junior dos Santos, a loss he has since avenged as champion. The 38-year old Cormier went unbeaten as a heavyweight before the move down in weight. This included wins over Antonio Silva and Josh Barnett in the Strikeforce organization and continuing his winning streak within the UFC’s heavyweight ranks with victories over Frank Mir and Roy Nelson. He came down to the light heavyweight division in 2014. His only career losses have come at the hands of Jon Jones, the second loss was later changed to a no contest after Jones failed an in-competition drug test prior to their UFC 214 bout last July.